This is my 200th Beer of the Week so I am delighted to be trying a new beer, from a brewery I have never written about before, from a country that I have never had a beer from ... New Zealand! 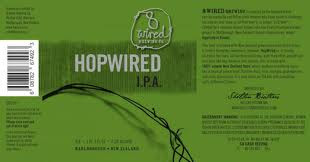 8 Wired Brewing Co. operates out of Renaissance Brewing in Blenheim, New Zealand, by owner/brewer Soren Eriksen. If this doesn't sound like a typical New Zealander name it is because he is originally from Denmark and spent much of his life traveling the world as a biochemist. It was in September 2008 when he quit his job researching sea urchins (Kina) for the University of Auckland, and followed his love of beer by taking a job with Renaissance Brewing. In working with the company, he realized that he wanted to brew his own beer but did not want to own a 'bricks and mortar" company so decided to brew under contract with Renaissance. For all you Non Zealanders, No 8 Wire (it was the 8th type of wire in the catalogue) is a specific gauge of wire originally used for electric fencing. In New Zealand it's use is much more widespread than that though, Kiwi's have used it to fix just about anything, from cupboards to cars, because it was versatile and readily available. Over the years it has become a symbol of the kiwi ingenuity, their ability to fix any problem no matter how limited the resources. Guild of New Zealand Champion Brewery award for 2011. First off it should be known that this is a truly 100% New Zealand beer. All the hops and malts were grown in New Zealand! The beer pours a dark golden colour with a white head. There are lots of lacings left behind when I sip, many more than usual. Citrus aroma leaps from the glass. Sometimes I struggle with aroma but not here. It is fully citrus and fully wonderful. According to the 8 Wired description on the website "A local Marlborough winemaker even said it smelled like gooseberries ... Gooseberries?" No, I didn't sense any gooseberries but then I wouldn't really know what they smelled like anyway! In researching Nelson Sauvin hops, I found they are supposed to impart the aroma of crushed gooseberries so likely it is there and I just don't recognize it. This is not a timid beer. When I take a sip, my senses are immediately shocked by bitter citrus and I love every minute of it. This is not a complicated layered beer but an IPA that is right in your face. No subtleties here! I love IPAs like this! Sadly this likely is a beer brought in by the LCBO for only a brief period of time. If I had full year access to this, it would be a regular visitor to my beer fridge. Here is an interesting 3 minute interview with Soren.